Teeth roots are not covered and protected by enamel. When exposed due to gum recession, they are at high risk for sensitivity especially to cold and during professional dental cleaning, erosion leaving defects at the gum line, cavities, and even nerve exposure. Gum recession generally has multiple contributing factors occurring at the same time, such as genetics, aggressive brushing, gum infection, history of braces, clenching and grinding, and local trauma. Taking measures to control some of these factors reduces the chance of having gum recession. 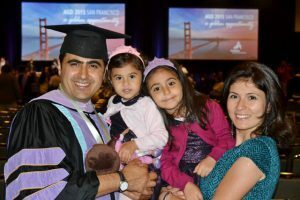 The Academy of General Dentistry (AGD) is pleased to announce that Samer Alassaad, DDS, FAGD received the association’s Fellowship Award during the AGD 2015 annual meeting, which took place June 18 to 21 in San Francisco. The AGD Fellowship Award is presented to dentists who seek to provide the highest quality dental care by remaining current in their profession. To earn this prestigious honor, Dr. Alassaad completed 500 hours of dental continuing education, passed a comprehensive written exam, and fulfilled three years of continuous membership in the AGD. As a Fellowship Award recipient, Dr. Alassaad joins more than 6,600 active AGD Fellows who have gone above and beyond the basic requirements to care for their patients’ oral health.